6.1-ounce; Double-needle coverseamed crewneck; Shoulder-to-shoulder taping; Double-needle sleeves and hem. 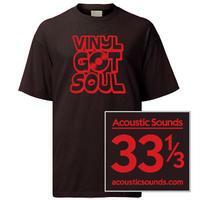 Vinyl Got Soul short sleeve T-shirts available in three colors. Choose from Black, Bluestone or Oxford in sizes S – XXL.